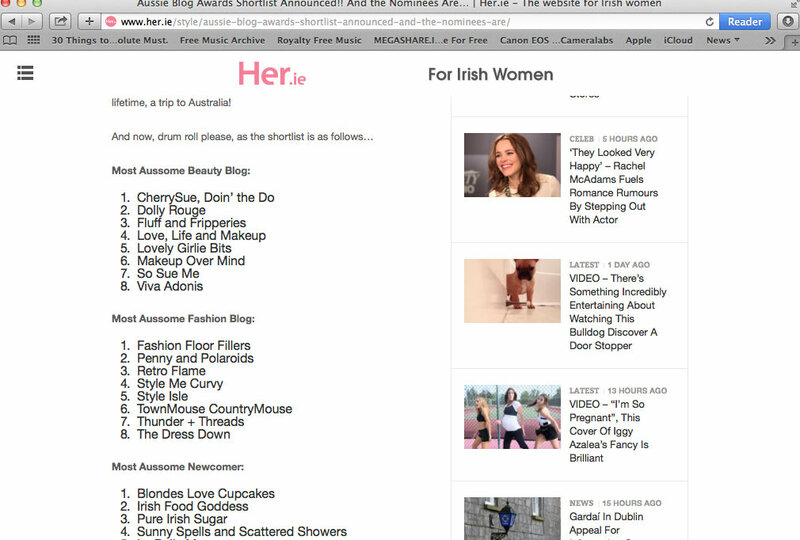 Just when I think my day can't get any better, yesterday I got an email saying we've been shortlisted in the Her.ie Aussie Blog Awards in two categories! As you know, this beauty blog is my first love, my second job and even though it's coming up to it's 4th birthday in a few months, I still love it like nowt else. Yes, I'm fortunate to get sent a lot of things to try, but yes, I'm demented enough to continue to buy more each week and have had to go on numerous spending bans over the years. Yes, I've bought Ikea furniture to store my makeup. Furniture that most people use to store actual proper things, but no, my millions of lipsticks, eyeshadows and blushes take pride of place in them. Yes, I've filmed a video that's over 30 minutes long showing you my stash... That's longer than an episode of Corrie and you know what, that was edited down so much because I was afraid people would think I was a madser and you might too after you watch it. Yes, you might watch it and think I should sign myself up to that Hoarders program and you might be right. Oh but I love it... How else can I explain 1,365 posts about makeup and beauty with a bit of Slimming World thrown in? We're in some great company and regular readers of the blog will know that some of the other ladies on the shortlist are great friends of mine, and I'm delighted to be in such a talented group of bridies! We've also made the Reader's Choice shortlist too, so if you're feeling generous, go on over and give us an aul vote and we'll be your best pals! We'll be heading to the awards on the 23rd of June and you can bet your Lovely Girlie Bits that we'll be vlogging that, so make sure you stay tuned for me trying not to fall, spill things on myself and the two Constantine (Sorry Joanne, you're a Constantine forever!) sisters have a ball! Thanks to the Her.ie team for shortlisting this little blog called Lovely Girlie Bits that has nothing to do with lady gardens or any such rudeness. We're classy bridies us! While I'm here, have a gander at our YouTube channel where we talk beauty, do a bit of vlogging, have the absolute sisterly craic and eat Harry Potter jellies that make us sick. We've big plans for this over the coming months so subscribe and be the first to see new videos! Thanks Sinead, the love goes both ways missus! Well written and well deserved Karen and Joanne! Thanks a mill Alex, over the moon! Just voted. Best of luck. Weekly Vlog #5 - The Aussie Blog Awards! Weekly vlog #4 - Space NK launch! New from Lush for summer 2014! Nima Brush - The Elite Collection review! Vlog - The Day Before The Wedding! Joanne & Will's wedding - Part 1!